Fortnite is finally coming to Android, but not in the way users might expect. Epic Games has confirmed that one of the world's most talked about games will not be released through the Google Play store. Instead, players will need to download the Fortnite Installer directly from the official website. The company's CEO Tim Sweeney tells GamesIndustry.biz that this is in part to build "a direct relationship with all our customers", but that the decision is also "motivated by economic efficiency" - namely avoiding the need to pay Google a 30 per cent cut of all revenue generated by the game. "The 30 per cent store tax is a high cost in a world where game developers' 70 per cent must cover all the cost of developing, operating, and supporting their games," he explains. "There's a rationale for this on console where there's enormous investment in hardware, often sold below cost, and marketing campaigns in broad partnership with publishers. But on open platforms, 30 per cent is disproportionate to the cost of the services these stores perform, such as payment processing, download bandwidth, and customer service. "We're intimately familiar with these costs from our experience operating Fortnite as a direct-to-customer service on PC and Mac." Indeed, Epic is also familiar with the costs of running an online store thanks to the Unreal Engine Marketplace and has already demonstrated its distaste for the 30 per cent cut. Last month, the success of Fortnite enabled Epic to not only lower the share it takes from asset sales to 12 per cent, but also retroactively paying developers what they would have historically earned with the new rate. "There's a rationale for [high store tax] on console where there's enormous investment in hardware and marketing. But on open platforms, 30 per cent is disproportionate to the cost of the services these stores perform"
And Sweeney is by no means shunning Google - in fact, he's quick to praise the firm for creating an open platform that enables Epic to deliver Fortnite in this way. The CEO has previously suggested Apple and Google's app stores take advantage of developers, but is pleased the latter at least offers a more democratic alternative as well. "Google is one of the world's leading supporters of open platforms - for example, as a top contributor to the open-source Linux kernel, which is at the heart of the Android platform," Sweeney says. "I think they're driven by the same ethos we have at Epic in opening up Unreal Engine 4's full source code to developers. "Openness creates an attractive, thriving ecosystem where everyone can innovate without having to ask for permission. Windows, Android, Mac, Unreal Engine, Linux, and other projects show that a company can open up its ecosystem and still run a successful and profitable business." Such platforms also bring companies closer to their consumers, with Sweeney adding that the rise of the internet and the digital revolutions means "physical storefronts and middlemen distributors are no longer required." "On open platforms like PC, Mac, and Android, Epic's goal is to bring its games directly to customers," he says. "We believe gamers will benefit from competition among software sources on Android. Competition among services gives consumers lots of great choices and enables the best to succeed based on merit." There is a danger that the lack of a store listing on Google Play will make it harder for Android owners to find the game - particularly the mainstream or younger users that might not be aware Fortnite is available without it appearing on the store's homepage. But the Epic CEO remains confident his firm will be able to reach its audience, reiterating that the installer can be found with "a simple web search... just as with Fortnite for PC and Mac." The game will come to Android later this summer, and Epic assures it will be the same 100-player game found on consoles and PC - continuing Sweeney's stance that game experiences should be the same across different platforms. Already a smash hit before it arrived on mobile, Fortnite saw its userbase surge when it released on iOS earlier this year. Epic is hoping for another boost with the game coming to Android, thus making it available on all major platforms, but Sweeney says the expectations (at least to begin with) are remarkably modest. "Fortnite requires a recent high-end Android smartphone," he explains. "Fortnite brings the game's full PC and console experience to Android; of the roughly 2.5 billion Android devices, we estimate around 250 million are Fortnite-ready." This will, of course, change over time and Epic is working closely with Google and Amazon (the latter for its cloud services) to optimise the game as quickly as possible. Fortnite continues to be a phenomenon thanks to its popular free-to-play Battle Royale mode, and is reportedly on course to generate $2 billion in in-game purchases over the course of that year. 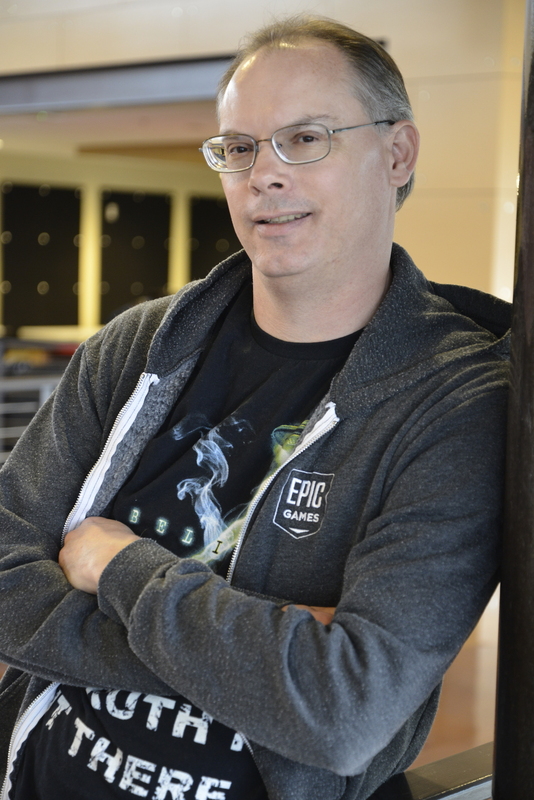 With all of the Android revenue going directly to the developer, Epic Games stands to continue its own growth, having recently been valued at around $8 billion.